Ashlen Diaz Wiki: Who is Post Malone's Girlfriend in 2018? Ashlen Diaz Wiki: Who Is Post Malone’s Girlfriend in 2018? While Post Malone’s newest album Beerbongs & Bentleys has been blowing up the charts, fans of the hip-hop artist are curious to know about the woman behind his inspiration. Post Malone’s girlfriend, Ashlen Diaz, has been a great support to the singer, on-stage and off! Nothing’s better than working with your woman while you make magic on stage, right? Posty would certainly know! Did you know that Ashlen Diaz is a concert promoter? And she’s not shy about using her skills to promote her boyfriend any way that she can! Ashlen Diaz has not been very public about her relationship with the hit-maker, and if you take a look at Post Malone’s Instagram account, you wouldn’t even know he had a girlfriend. But the two are still reportedly going strong, he’s crazy in love with her, and their privacy is something they want to keep. Who can blame them? Ashlen Diaz is a very private woman, and her Instagram page shows very little of her bonding with rapper Post Malone (whose real name is Austin Post). However, the couple has reportedly been going strong since 2015. Ashlen Diaz is 22 years old and celebrates her birthday on December 19th. Diaz worked as a promoter at Cashaveli TX. She was with the company for three years from 2013 to 2016. It was apparently during that time that she began her relationship with Posty. She then went independent as a concert promoter and is now self-employed. She is currently placed in the Greater Los Angeles Area. It’s a possibility that she lives with her boyfriend in his contemporary-style home. However, this hasn’t been confirmed. Again, you wouldn’t really know it from scrolling through the latest pics on Post Malone’s Instagram account, but they reportedly began dating before anyone saw his name in flashing lights. He’s posed with the likes of famous females like Demi Lovato and Paris Hilton, but the lack of images of his own girlfriend seems to raise a few eyebrows. Then again, he more than makes up for it on his other social media outlet like Twitter; check out his adorable b-day post directed at his lady from 2015! How Did Post Malone and Ashlen Meet? Ashlen Diaz is from Dallas, Texas. Post Malone moved to Texas when he was eight years old. The couple was featured in a video for The Breakfast Club, and Ashlen spoke a bit about how they met. She said that she was a promoter in Dallas and that they met through work. But Malone had been following her on social media before that. But it wasn’t until “White Iverson” was released that she befriended him, too. Diaz then worked her promoting magic for Malone. She booked him for shows in Dallas, Atlanta, and many other hot spots! Malone admitted that he fell in love with her at the time. He added that the beautiful snowfall also helped! Since then, the two have been inseparable and Posty has no problem gushing about his lovely laddy in interviews! However, rumors are always swirling these two and whether or not they’re still together. And with new songs like “Over Now” and the lack of any recent photos of her on his social media, it’s easy to see why. Did Post Malone Break Up with His Girlfriend? Ever since Posty’s new album was released, fans are wondering who broke his heart to inspire him to make the album! But we don’t think that a break-up caused the rap star come up with Beerbongs & Bentleys. It’s true that the lyrics to many of the tracks on the album lean toward a broken heart. But Post Malone is most likely not dealing with one in reality. But the couple has been very secretive about their relationship. So, it’s hard to decipher this one! Ashlen Diaz broke post’s heart. Thank me later. Since the couple works in the same industry, Ashlen Diaz has been seen with Post Malone at most shows, concerts, and tours. It has already been three years since they started dating. And those who don’t believe that Malone has broken up with Diaz, are now wondering if the 22-year-old rapper is set to take this lovely relationship to the next level! 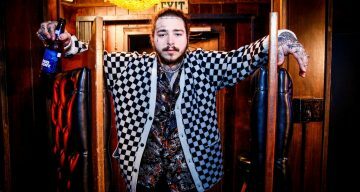 Rumors of the couple splitting up made rounds on the Internet a while back, but Diaz and Post Malone both shut the gossip down with their strong bond. Posty himself took to Twitter to shut down the rumors of their split back then. guys me and ash didn’t break up lol…. relax. they’re song lyrics by the almighty Leon. And, Ashlen Diaz’s Instagram is still loaded with pics of Posty! We just can’t get enough of them together—and clearly, neither can they! Malone is obviously head-over-heels for his woman. He went on record to say that he wouldn’t do anything that could ruin it for him and her. When asked about being a rapper and cheating on girlfriends, he said that he’s a good guy and would never go to the lengths of cheating on Ashlen Diaz. He also openly admits in interviews just how much he loves her. And it looks like Diaz feels the same. Just a day ago, Ashley Diaz posted a photo of the two of them to her own Instagram account…and they certainly don’t look broken up to us!